Aaroh is a campaign for asserting rights and demanding justice for women farmers in Uttar Pradesh. Disha is a regional coordinating organisation for Western Uttar Pradesh and is working with several voluntary organisations in as many districts of the region. In all there are five in different regions of Uttar Pradesh and the campaign is being coordinated by Gorakhpur Environmental Action Group (GEAG) with support from Oxfam (India) Trust. Women farmers represent one of the crucial development forces in the world. They grow, process, manage and market most of the food and natural resources. They are the largest workforce in India. According to a study, nearly 84 per cent of all economically active women in India are engaged in agriculture and other allied activities. Agriculture employs 4/5th of all economically active women; they make 1/3rd of the agriculture labour force and 48 per cent of self-employed farmers. 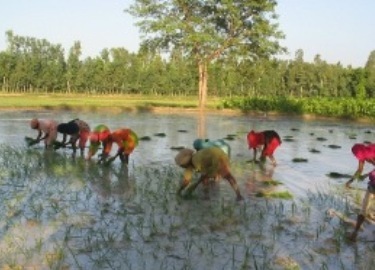 According to another study, Uttar Pradesh, where 72 per cent population is involved in agricultural activities, is one of the largest contributors of food production towards the nation's granaries. Though women constitute 48.5 per cent of the total population of the state, women in agriculture are still a neglected workforce. Although they are responsible for more than 75 per cent of agricultural activities, their share in agricultural productivity was shown only 12.9 per cent despite the work participation rate of 18.4 per cent, according to Census 1991. The number of total workers in Uttar Pradesh, according to Census 2001, is 54,180,232, of which men are 76 per cent and women are merely 23 per cent. Amongst these women, only 34 per cent are classified as cultivators and 41 per cent as labourers, whereas amongst men, 42 per cent are cultivators and 20 per cent as labourers. This clearly explains that the work opportunity in the sector to women is merely 23 per cent and they are mostly working as labourers – the category of cultivators being so small. However, the contribution of such a large working population cannot be simply ignored. In terms of wages, in spite of being the highest contribution of food grains to the national food stock, the wage rates for unskilled labourers in Uttar Pradesh is much lower as compared to the other states. The state of women's control over the land also presents a gloomy picture in the state. Only 6 per cent women are legally owner of land while joint ownership over the land is astonishingly merely 3 per cent. Copyright © Disha Social Organization 2004-2019. Designed, hosted and maintained by Aadi Creations.